Oh, if only more of our trips had such smooth seas! 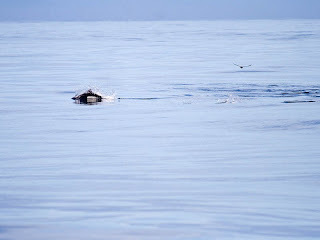 A Dall's Porpoise surfaces as a Pink-footed Shearwater glides by. Photographed off Newport, Oregon August 8, 2009 by Greg Gillson. 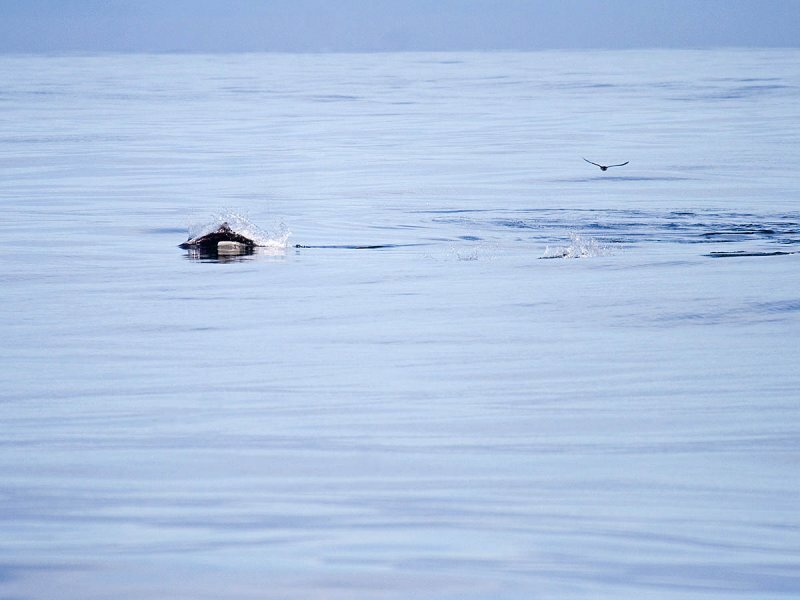 Erik Gauger, one of our participants on last August's Perpetua Bank trip from Newport, Oregon, blogs about his first pelagic birding experience on his Notes from the Road. I must say the photos and narration on Erik's site are magnificent. My photos are decent pictures of birds, while his photos are artwork with an emotional appeal with a bird as the center piece to tie it together. How does he do that? The trip report from this August 8, 2009 trip are on The Bird Guide's pelagic web site. My photos from the trip are on my pBase photo gallery site. New half-day pelagic trip from Newport, Oregon! 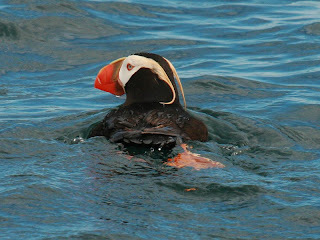 Tufted Puffin, a target species on our new half-day pelagic trips. Photographed off Newport, Oregon August 10, 2008 by Greg Gillson. This spring we inaugurate a new half-day pelagic trip from Newport, Oregon. The first trip is Saturday, April 3, 2010. The second trip is Sunday, May 16, 2010. Designated as a Manx Shearwater search trip, this exciting nearshore trip will spend time getting good looks at all of Oregon's breeding alcids, as well as swing out a few miles to study flocks of shearwaters. 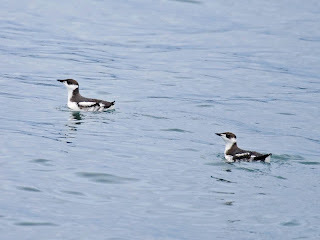 Common Murres, Pigeon Guillemots, Marbled Murrelets, Cassin's Auklets, Rhinoceros Auklets, and Tufted Puffin are expected on every trip as we cruise just offshore along the scenic Oregon coast. 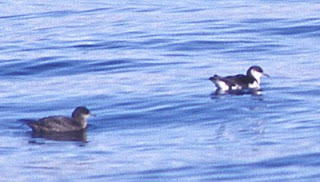 Marbled Murrelet, a federally threatened, but locally common, nearshore species. Photographed off Newport, Oregon February 21, 2009 by Greg Gillson. Besides these target species we expect several loons, grebes, scoters, cormorants, and sea ducks, in season. Marine mammals should include California and Steller's sea lions, harbor seals, harbor porpoises, and gray whales. On-board guides will point out birds and explain identification and natural history of both birds and mammals. But wait! We're not finished! After a couple of hours traveling along shore we swing out several miles in search of flocks of shearwaters. Sooty Shearwaters, Pink-footed Shearwaters, and Northern Fulmars are expected on every trip. Short-tailed Shearwaters (spring) and Buller's Shearwaters (fall) are also expected, in season. Common Terns, Pomarine and Parasitic Jaegers, and possibly Fork-tailed Storm-Petrels can be expected from time to time. The target bird, whether along shore or a bit farther out, is the rare Manx Shearwater. This common Atlantic species has been seen along the North American West Coast the past 15-20 years. In recent years Oregon has averaged over 6 birds per year spotted from shore. We expect to have a very good chance of spotting this species by boat from April-May and September-October off the central Oregon coast. This trip spends its entire time in prime Manx Shearwater habitat. Oregon's first photographically documented Manx Shearwater (right), and a Short-tailed Shearwater (left). Photographed off Newport, Oregon March 1, 2003 by Steve Shunk. This trip has abundant birds in view at all times. This leisurely trip is suitable for first-time ocean birders, the budget conscious, nature photographers, and rarity searchers. The trip departs at 7:00 a.m. and returns to port at noon. Cost is $85 per person. Find out more and sign up on The Bird Guide's pelagic web site.